I've recently got Snap UFB 100/20 installed. Problem is, no matter what i've tried, I can't get over ~93Mbps down. Testing with ONT plugged into my fast linux PC (ie lots of cpu for pppoe overhead, 1 Gbps NIC), pppoe mtu at 1500. No icmp blocking. 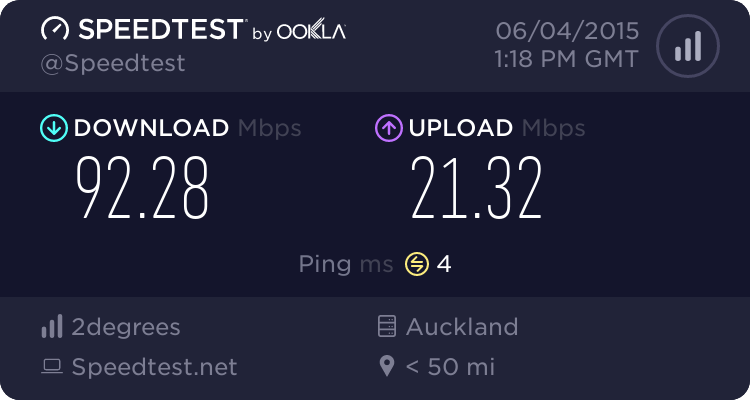 Testing to Snap Auckland speedtest server (i'm in Auckland). Same results even with Mikrotik doing the routing which is my normal mode of operation. Same on any day of the week or hour of the day (including off-peak). I'm not expecting miracles like 100Mbps at peak times to London, but I don't think it's unrealistic to expect 100Mbps at the least congested time like 1am when I did this. What am I doing wrong Snap? This appears to be a systematic fault. Are Snap falsely advertising this as 100Mbps, or is it just me? Could it be a provisioning fault? I've had UFB for 3 weeks now and this hasn't changed. Ild assume snap are doing 100mbit layer 2 rather than layer 3. Remember to consider all your overheads if that is the case, and then about 93 or so mbit sounds about right. A 100 Mbps UFB service is usually 100 Mbps at Layer 2 and a speedtest will typically show around 93 Mbps. Your result is marginally lower than expected but it is more important how it changes during the day. If stable at your rate then you are better off than a number of others with different providers. If speedtest is showing at least 100 Mbps Snap might have made a call to use a faster service and apply slightly different limits to get the "headline" speed. This will cause some confusion as it does need more than 100 Mbps at Layer 2. UFB speeds were based on dimensioning at layer 2, not layer 3 because this is how Ethernet has always worked. You can't get 10Mbps on a 10mbps Ethernet connetion, 100Mbps on a 100Mbps Ethernet connection, or 1Gbps on a 1Gbps Ethernet connection. Much of the early UFB testing by Truenet was very flawed because they didn't take this into account, or even bother to mention it. I think UFF were the only provider who from day 1 decided to over dimension to compensate for layer 3 overheads. This all changed last year when Chorus introduced their Evolve / Right Performing plans that introduced contention to UFB and also overdimensioned plans to compensate for layer 3 overhead. As 100/20 is an Evolve plan, and it's highly likely you're on this, your plan will be dimensioned for this, and the fact you can only get 92.5Mbps looks exactly like the issue you'd get with a PC or router that's only negotiated at 100Mbps, not 1Gbps, as somewhere in the vicinity of 93Mbps is the most you can ever get on a 100Mbps Ethernet connection. But as for it being a problem - it's not. UFB is a best effort service and the only speed guaranteed on your plan is your 2.5Mbps CIR that is accessible with the correct 802.1p tag - your headline 100Mbps / 20 speed is an EIR. It is also possible that Snap aren't using Evolve plans and have no overdimensioning in place, in which case there isn't actually a problem at all either. I'm more than aware of the differences between 100Mbps at layer 2 vs layer 3. Problem is I was sold a service that was advertised as being able to get up to 100Mbps layer 3. If I can NEVER get that (even at 1am) then it is false advertising. Does anyone have any specs on the right performing profiles? I'm absolutely connecting at 1Gbps to the ONT. "This service offers speeds of up to 100Mbps download and up to 20Mbps upload". You're mistaking the name of the service with the technical specifications. Stop whining about an unimportant detail that everyone else understands is not a promise, it's not reflecting well on you. If you're unhappy move to another provider. timmmay: Snap Lightwave 100 specs. Snap are an Internet provider, and IP runs at layer 3. Their claim therefore can be reasonably interpreted as providing IP services up to 100Mbs^-1. The CIR is irrelevant when the claimed speeds are unachievable even under ideal circumstances. If Snap were dealing with a single fibre provider, and their services were limited to 100Mbs^-1 layer 2, then I would absolutely agree, the statement is misleading, albeit in a way which isn't particularly significant. It is likely however, that in different regions, the same plan has slightly different performance characteristics (my 200Mbs^1 plan exceeds that), in which case the statement "up to 100Mbps" remains true, but I do think there should be a statement indicating stated speeds may be layer 2 specifications. Guys, the number SNAP advertise says 100. He's doing a speedtest and not getting 100. Snap need to step up and fix their obvious problem. Are you sure your devices are both negotiating at FE or Gigabit? You haven't answered this yet. I've seen plenty of Snap speedtest images showing overdimensiong in place on the 200/20 plan, so until the question about devices negotiating at 100Mbps is answered, it's hard to look beyond this. Irrelevant if the stated maximum is impossible. If you honestly believe this is a fault, ring Snap and talk to them, their helpdesk guys are great. It's no different to many ISPs advertising ADSL2+ as "up to" 24Mbps - a figure that can't be achieved at layer3 in 99% of environments. sbiddle:It's no different to many ISPs advertising ADSL2+ as "up to" 24Mbps - a figure that can't be achieved at layer3 in 99% of environments. The big difference between ADSL2+ and fibre is that ADSL2+ is constrained by line conditions, and almost nobody can obtain the theoretical maximum anyway. If someone else's ADSL is faster, people will assume they are closer to the exchange/cabinet. 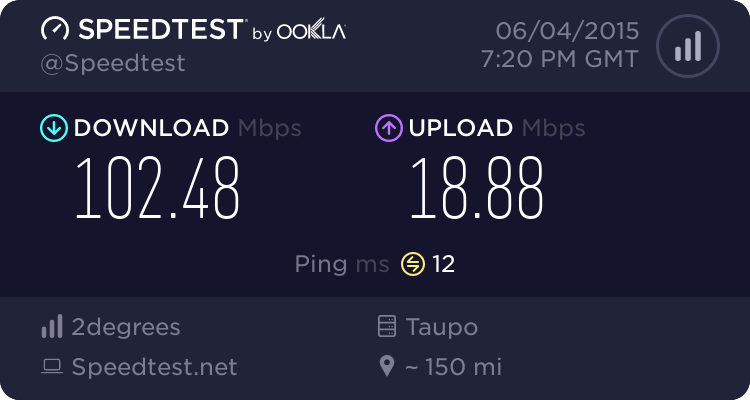 With fibre however, maximum throughput is possible, and I can see why someone would be upset that they only get 93Mbs^-1 on their 100Mbs^-1 connection, when others like myself get 202Mbs^1 or more on a 200Mbs^-1 connection. Personally, I'd not be concerned about the 7Mbs^-1 difference, and even dropping 109Mbs^-1 off my current speeds, in excess of 99% of the time it would make zero difference under real-world usage. I can only think of one occasion where I'd pushed the connection above 100Mbs^-1, and was under significant parallel load from streaming sites and CDN providers.